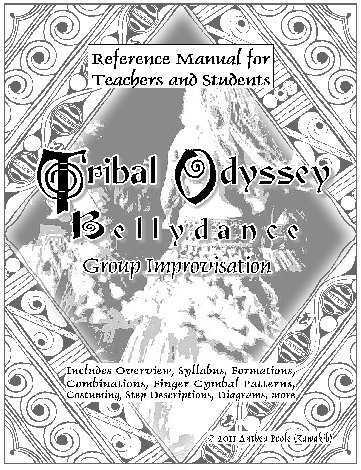 Note that this Manual is a reference work, not an "instruction book" on teaching or learning Tribal Odyssey. Are you interested in teaching this fun new format to your bellydance group? Please consider Kawakib's Teacher Certification. It provides a logical and coherent course designed to help you teach this unique style of bellydance in a way that's easy for students to comprehend and enjoy. If you are new to teaching in general, Kawakib also offers a GUIDE TO TEACHING that can help you plan classes for any style of bellydance. DVD RETURN POLICY: DVDS are not returnable for refund or credit. If a DVD contains a significant manufacturing defect, the DVD will be replaced with an identical undamaged item. Notification must be made within one week of receipt of merchandise; if there is a problem with your order, please contact Kawakib immediately. Returned items must be received within seven business days of notification of defect and must be accompanied by the original receipt. Your shipping costs for the original order will be refunded. Your shipping cost to return the damaged DVD will not be refunded; however, a new DVD will be shipped to you free of charge.